SEATTLE, June 26, 2017 /PRNewswire-USNewswire/ -- The supporters of Wounded Warrior Project® (WWP) come from all walks of life, and their generosity allows WWP to provide free, life-changing programs and services to injured veterans, their caregivers, and family members. 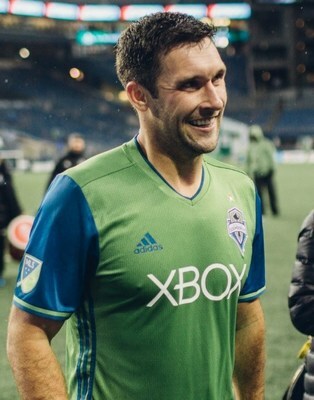 Recently, Will Bruin of the Seattle Sounders Football Club used his platform as a professional athlete to raise awareness for WWP and request support from his fans and followers during the Give Big Seattle charity event. "The military was a big part of my local experience when I lived in Houston," Will said. "I played for the Houston Dynamo for the first six years of my professional football career, and one of the guys I knew there was very involved in the armed forces. I looked up to him when I was younger and just learning my way in the sport." In December 2016, Will was traded to the Seattle Sounders. When he arrived in the Pacific Northwest city, he noticed something was very different right away. "Living in Texas for years, you get used to that presence of veterans and how important it is," Will said. "But I noticed there wasn't a very a strong charity presence for wounded veterans in Seattle. I wanted to help bring awareness to that, and I knew that Wounded Warrior Project had been active locally and done some great work." Will didn't serve in the military, and neither did any of his family members, but for him, it went beyond a familial connection. It was about the act of service that allowed him to play the sport he loved. "In my eyes, those wounded warriors who fought and sacrificed are the true heroes in our country," Will said. "They sacrificed their lives, and in the grand scheme of things, it's something that needs to be talked about more and brought up more. I see how injured veterans need more care than they're getting and need help in areas where there isn't any. We all play a part in helping our wounded veterans find healing again at home." To learn and see more about how WWP's programs and services connect, serve, and empower wounded warriors, visit http://newsroom.woundedwarriorproject.org/, and click on multimedia.